The book never stood a chance. The swarm of robots (aka the "swarmanoid") that set out to retrieve it was just to fast and organized...well, maybe not so fast. The project is a Future and Emerging Technologies (FET-OPEN) experiment of Marco Dorigo at Université Libre de Bruxelles, Belgium and funded by the Commission of the European Union. 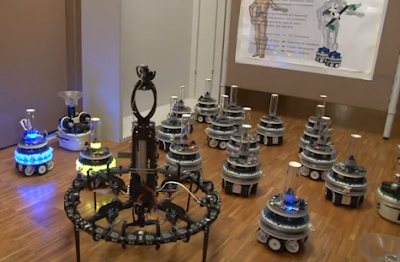 It's a great example of current research on robots communicating and working together to accomplish a task. Lucky for us, the swarmanoiod has a way to go before it reaches Borg status. And yes, we did notice the C3PO poster in the background. Bonus points! More information on swarm bot projects can be found at www.swarm-bots.org.